Passover hasn't even begun, and I'm already frustrated with so much talk about food. Well, this year it's not hametz that is at the root of so many debates in the Jewish community, but rather kitniyot. Kitniyot is the Hebrew term for non-hametz food products like corn, rice, beans, and legumes, such as soybeans, peas, lentils, and peanuts that Ashkenazi Jews traditionally have not eaten on Passover for the past 700 years. The Conservative Movement, of which I affiliate, announced a major change this past fall with regard to the permissibility of consuming kitniyot on Passover. Throughout the holiday, we are forbidden from eating (or even possessing) the five grains designated as hametz -- wheat, barley, spelt, oats, and rye. While Sephardic Jews have always eaten kitniyot, Ashkenazic Jews have regarded them in the category of forbidden Passover foods for a few reasons that don't make sense anymore. The recent teshuvah (responsum) approved by the Conservative Movement’s Committee on Jewish Law and Standards really isn't as monumental as it sounds, because in 1989 Conservative Rabbi David Golinkin, in Israel, essentially overturned the ban on kitniyot with his own teshuvah. 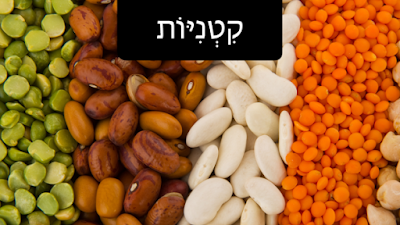 The Conservative Movement of Judaism has approved eating kitniyot (legumes) on Passover. While there has been so much debate over the past several weeks on the issue of eating kitniyot, that is actually not my concern. With the crazy political nature of the kosher certification world, I'm actually cautious about expressing my own opinion on the kitniyot debate as it would have significant ramifications for the kosher certification agency I founded eight years ago. My concern is not whether we should be eating rice cakes with peanut butter and corn tortillas with refried beans on Pesach (Passover). My focus is on the nature of these debates taking place this spring in Conservative synagogues throughout North America. First and foremost, there are much bigger fish to fry in the Jewish community right now than whether kitniyot should continue to be forbidden because Bubbie and Zaydie didn't eat them on the eight-day festival. Issues like world hunger, gun violence, poverty and war certainly make the question of whether a Jewish person can eat a raw pea pod on an 8-day holiday on which leavened wheat is forbidden inconsequential. I'm sure the Soviet Jews, known as Prisoners of Zion a few generations ago, are bewildered that there are actually Jewish people debating about kitniyot when they had to risk their lives in the Former Soviet Union just to smuggle in a few pieces of matzah to fulfill the commandment. My frustration is that so many of my rabbinic colleagues are passively resting on the easy argument of "The Tradition," when they should know that our Judaism isn't always trumped by the past, but it is fluid and must also change to stay relevant and meaningful. Rather than hear my colleagues state dismissively, "Well, we've been doing it that way because that's what our ancestors did and so we'll just continue to do it that way," I'd much rather hear the active statement of,"Where there is a rabbinic will, there is a halachic (Jewish legal) way." Regardless of a rabbi's personal decision on the matter of kitniyot, the correct modern approach for rabbis to this newsworthy decision would be that in the years to come we can and we will work to ensure there will be options available to make kitniyot consumption a possibility while still adhering to the strictures of the Passover holiday. That would be a true embrace of the dictum "tradition and change."